On February 20, 2009, Smith & Wesson issued a RECALL of Walther PPK and PPK/S pistols. This recall applies to all Walther PPK and PPK/S pistols manufactured by Smith & Wesson from March 21, 2002, until February 3, 2009. Smith & Wesson has identified a condition that may exist in certain PPK and PPK/S pistols which may permit a round to be discharged without the trigger being pulled. 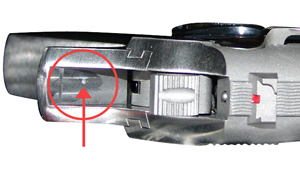 When the manual safety is disengaged, Smith & Wesson’s Product Engineering Group has determined that the possibility exists in certain firearms that lowering the hammer may cause a chambered round to fire. CLICK HERE for the Serial Numbers of the pistols subject to this recall. Smith & Wesson advises: “STOP USING YOUR PISTOL AND RETURN IT TO SMITH & WESSON AT ONCE. Any unintended discharge of a firearm has the potential for causing injury, and we ask that you stop using your pistol immediately. To receive a UPS pre-paid billable stamp and shipping instructions to arrange for the modification of your pistol, CLICK HERE or contact Smith & Wesson directly at 1-800-331-0852. Share the post "Smith & Wesson Recalls Walther PPK and PPK/S Pistols"